Fed up with rampant piracy on the Nintendo DS, Nintendo and Capcom are spearheading a coalition of 56 publishers intent on putting an end to the R4 flash cartridge. 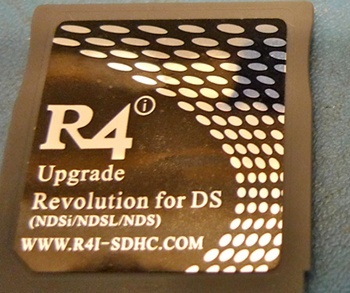 If you've been living under a particularly ethical rock for the past few years, the R4 cartridge is essentially a rewritable memory card that plugs into your Nintendo DS in the same way a standard game cartridge would. The big difference between the R4 and your average copy of Nintendogs however, is that the R4 can also be attached to your computer where less than scrupulous gamers could install any number of pirated DS games directly to the R4's flash memory. Nintendo has repeatedly attempted to end the distribution of the R4, seemingly with little effect. The device remains relatively easy to purchase, even for those unfamiliar with the darker, grog-soaked corners of the 'net. It's unclear exactly what the new coalition of publishers has planned for their attempt at squashing this tiny plastic menace, but there seems to be two distinct ways to view this information. On the one hand, it's quite impressive that such a large number of disparate companies who would otherwise only ever meet as rivals in the marketplace have set aside their differences, at least momentarily, to rise up against an implacable foe that threatens them all. On the other, it could be seen as a compliment toward the ingenuity (or brazen chutzpah) of these pirate manufacturers that despite tens of millions of dollars in litigation alone, companies like Nintendo who attempt to dictate to consumers how hardware they have purchased should be used, can not win against the demands of the free, open market.